Saturday evening was frustrating. After a glass of wine in my local while I read the papers – the Times magazine was especially good that day – I conceived an almost overwhelming desire for a curry. I don’t often get food cravings, and my appetite, despite my rotundity, is small, but when I do they are powerful. Not to worry. I have recently moved to Clapham, and I knew there to be two good curry houses on the Northcote Road. So I gathered up the papers and my laptop, and set off against a fine drizzle to slake my Indian thirst. Problem one: the first place has either closed down recently or is not where I remember it being. I thought it was somewhere between the junctions of Mallinson Road and Bennerley Road. But Indian restaurants there were none. Not to worry; I knew there was another one pretty much across the road. So I heaved myself there and heartily requested a table for one (please, no violins). Problem two: they were fully booked and could only offer me a table for 45 minutes, and I do hate to be rushed over my meals. So I muttered Muttley-like imprecations and left in what I believe is usually called high dudgeon. Fast forward to Sunday: my craving was still there. So, as I should have done the previous night, I performed a bit of judicious Googling, and discovered – I suppose I must have known but the information had not lodged sufficiently firmly in my brain – that there is an Indian restaurant at the end of my street. Strictly speaking, it is an Indian-Nepalese restaurant, but that is fine by me, as I am a strong supporter of the Gurkhas. It is called “Curry Leaves”, and it is on Falcon Road (SW11). Readers, go. It’s an unassuming, very modestly-sized venue (maybe would seat 25 at a push? ), but I felt welcome as soon as I pushed open the door. The proprietor, for I assume it was he, was very definitely Nepalese rather than Indian, and the flag of Nepal hangs between the Union flag and that of India in the window. He was charm itself, offering me poppadums (yes, please) and a good selection of Indian beers (I went for Kingfisher, though other brands are available). Knowing that I don’t eat very much, I eschewed a starter, though there were some tempting dishes on offer. For my main, I opted for a chicken dhansak with the usual rice and naan, and, readers, it was delicious. I love lentils under pretty much any circumstances, and the dish had just the right level of sourness that a good dhansak needs. The portions were generous but not over-facing, and the rest of the menu looked tempting (hell, you can Google it for yourselves). I thought particularly of my friend Hugh, a devotee of all things spicy, when I spotted a fiery dish called “Chicken Everest”. 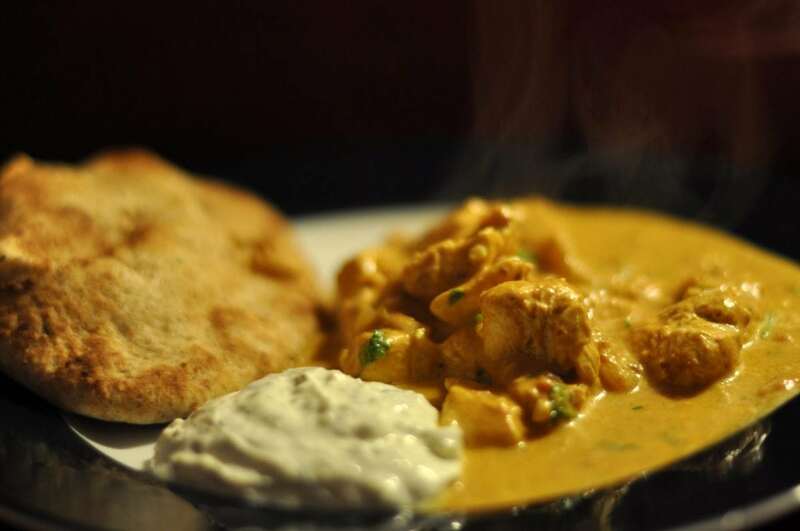 I wouldn’t say I’m a curry aficionado (a word Tatler tells us is terribly non-U anyway) but I’ve had some very good curries in my time, and for eight years I lived in St Andrews, home of the now-defunct Balaka, which was regularly voted the best Indian restaurant in Scotland. So I know my curry onions. This was as good as anything I’ve had. But what made it all the better, all the more satisfying, was the warmth of the reception. Mein host asked me if it was my first time there, and whether I lived locally, and responded almost fawningly to my compliments on the food. Nor did he bat an eyelid when, long after my food was eaten and cleared away, I asked for a glass of wine and a coffee, with which I read the Sunday papers. He really gave the impression that nothing was too much trouble,, and I overheard him being similarly hospitable to other customers. He is obviously a sharp cookie, too, as he knew exactly when a pair said that friends of theirs had recommended the place to whom they were referring. Little things like that make all the difference, especially in such a crowded market as selling curry in London. I know I must set my sights further. Having lived in London for so long, it is sad but true that I have never been to Brick Lane for a curry (nor read the eponymous book). Something to rectify, certainly. But to discover a delectable and hospitable Indian restaurant literally at the end of my street – next to a Mediterranean bistro called Fish in a Tie, which I must also sample – is a stroke of great fortune. There were several other dishes on the menu which tempted me, from the familiar (for curry is very comforting) to the unusual. Maybe I will brace my tastebuds for a chicken Everest one day. In any event, I will be back. And you should go too. Just not too many of you, all right? It’s not a big place.